HIGHWAYS. Roads in Cleveland and other cities have served 2 main purposes. First, roads were built for commerce, including traffic movement and economic growth. Next, roads helped create and separate neighborhoods, allowing development of specialized districts for housing and business and an increase in property values. Inevitably, proponents of roads for traffic purposes came into conflict with those favoring the community and property interests of those living alongside. Officials in Cleveland and Cuyahoga County enjoyed only modest success in accommodating these conflicting goals. After 1900 state and federal officials financed part of the construction costs, leading to an upward shift in the level of conflict but no better luck in resolving it. The net result during the period between 1796-1990 was the creation of a vast and improved road network that never appeared affordable and adequate for traffic flow and local development. In 1796 MOSES CLEAVELAND† and his survey party reached the site of the city and began marking off streets for future settlement. The grid idea with a couple of radial routes prevailed. Cleaveland’s group sketched PUBLIC SQUARE, with Ontario running north to south and Superior east to west marking the center. Four additional streets bounded the outskirts of the area. In 1797 a second group of surveyors added 3 additional streets to the town plan. Actually, none of these streets existed; the marking of roads was simply a component in the division of land into lots for expeditious sale, the primary interest of the CONNECTICUT LAND CO. The net result of the 2 plattings, however, was to create a frame for Cleveland’s development that emphasized expansion toward the east and south. From 1810-15, only Superior and Water streets were open for travel, but tree stumps and bushes remained as obstacles. Ontario was open south of the square but was equally undeveloped. During the 1820s, growth of a warehouse and wholesale district in the FLATS along the CUYAHOGA RIVER encouraged officials to develop adjacent roads. On the far north, Bath St. ran between the river and Water St. Farther south, 4 lanes allowed traffic to descend into the Flats from Water and Superior streets. Construction in 1824 of 2 bridges across the river linked commercial and residential development around Public Square with river traffic and the smaller west side. Approval and completion of a route, it appears, rested on a petition presented by property owners, along with the perception among officials that property values and trade would be enhanced. Streets constructed after 1820 often were named for leading businessmen and politicians who fostered commerce. Case St. honored LEONARD CASE†, a prominent real-estate developer. In 1836 the council dedicated Clark St. for Jas. S. Clark, who had constructed the Columbus Bridge with a view toward development of his property in the Flats. After 1840 leaders in urban America undertook the task of improving their streets. In 1880 Geo. Waring, an engineer active in street and sanitary improvements, conducted a survey of street conditions in the nation’s cities. Half of the streets remained unpaved; only 2.5% of the paved roads were constructed of asphalt, a smooth, dust-free surface. During the 1870s, officials in cities such as New York, Cleveland, Chicago, and Washington, DC, had installed wooden blocks, which muffled the noise of horses and carts. But wooden streets, soaked in creosote oil as a preservative, fueled the fires that occasionally destroyed portions of major cities. Other surfaces included cobblestone and granite blocks, set on beds of sand, and gravel, the cheapest type of surface. Because abutters rather than the city usually financed improvements, the emphasis was on rapid extension of streets to houses and buildings in outlying districts rather than on securing the best surface. Many hoped that street improvements would encourage a quick increase in property values, perhaps leading to the creation of exclusive residential districts, such as Chicago’s Union Park and EUCLID AVE.. in Cleveland. The desire for miles of cheap roadway guided street designers in Cleveland. By the early 1880s, a lengthy network of streets, bridges, and viaducts had been constructed. The city had increased in size to 26.3 sq. mi., and the number of streets had jumped to 1,155, running 444 mi. in length. The CENTRAL VIADUCT was under construction to connect the city at Ohio St. with outlying areas south and west. The quality of surfaces varied; approx. 92 mi. had been graded, and another 32 mi. graded and curbed. During the 1840s, city officials had paved Superior St., and by the 1880s paving, though still costly, had been applied to 58 mi. Altogether, 41% of the city’s streets were improved. However popular these improvements, neither the costs nor the construction materials proved satisfactory. During the mid-1880s, officials installed block stone over several streets, including Broadway, Woodland, Superior, and Erie, a length of 13 mi., at a cost of $723,000. But the block stone was in fact the third type of improvement attempted; earlier pavements, including asphalt, had become “unendurable” and had generated a “long controversy.” Nor was controversy limited to this particular project. During the early 1870s, property owners had petitioned the council to open 17 streets, including Payne and Sheriff. Approval rested on the legal requirement that petitioners would repay bonds issued by the city through tax assessments amounting to more than $1 million. Once the improvements were in place, however, several of the beneficiaries secured a court order preventing the city from collecting the taxes. Around 1900, rapid increases in auto sales began to highlight older problems and create new ones for those charged with road building. Competition between trolley operators and motorists for limited space added a fresh dimension to the traditional question of whether roads should benefit traffic flow or property values. Unable to satisfy diverse constituencies, road officials accelerated the pace of improvements and extensions. Between 1900-40, officials at every level paved more than 1.2 million mi. Local authorities proved unable to finance such costly improvements, forcing the level of highway funding (and decision making) up to the state and federal levels. In fact, the “battle for the streets” in cities such as Chicago, Los Angeles, Pittsburgh, and Cleveland prompted federal officials to contemplate funding the construction of a national expressway system. During the 1920s, road engineers and political leaders in the Cleveland region undertook major programs of extending and widening streets and roads. Federal and state funds were available for a number of these projects, which helped reduce the burden on local ratepayers and permitted more construction. Four-lane highways, replacing narrower and often twisting roads built prior to heavy traffic, were a popular design around Cleveland and many cities. On the far east, Kinsman, Euclid, and Lee roads were among those upgraded; and on the west, the 4-lane projects included West Lake Rd. Widening of older streets inside Cleveland proved slower and more costly, but engineers widened and resurfaced a large number, especially where trolleys and automobiles competed for space on narrow brick pavements. Projects such as the widening and extension of Chester from E. 13th to WADE PARK had to take place in sections of 8 to 10 blocks a year. In 1928 engineers counted nearly 1,800 mi. of roadway in the region constructed with federal, state, and county funds. Even more, they planned redevelopment and construction totaling 281 mi. in Cuyahoga County and another 312 mi. in the outlying areas at a cost of $63 million, exclusive of rights-of-way and damages. By the early 1940s, the construction of limited-access roads, popularly known as expressways, appeared to offer a solution to traffic jams and political stalemate. In 1939 the U.S. Bureau of Public Roads offered formal articulation of a plan for constructing a national expressway system. Within a year or two, road engineers and city planners formed committees to fix local routes and secure the support prerequisite to a lobbying campaign with state and federal governments. 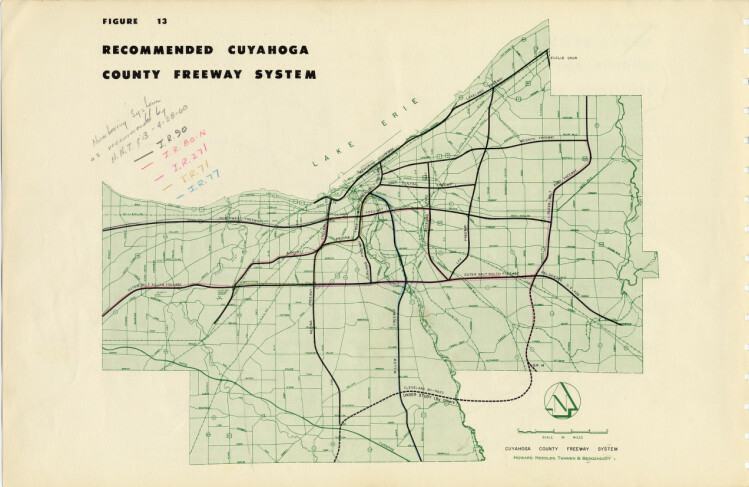 In Nov. 1944, members of the committee in Cleveland published a plan for expressway construction consisting of an inner and outer beltway plus 7 radial routes. Expressways would eventually serve 20% of the region’s traffic, or so ran the reasoning, drawing enough traffic from local roads to eliminate “need for many extensions and widenings.” Fewer autos on local streets, in this scheme, would “ensure quiet in the neighborhood,” encouraging residents not to seek “`greener pastures’ in the suburbs.” Proponents of expressways in Cleveland, as elsewhere, also promised a reduction in the number of accidents and, of course, “quick movement of heavy traffic.” Estimates of costs ran to $228 million during the course of 10 to 20 years, with the state and federal governments paying most of the bill. Between 1958 and the mid-1970s, planning and construction of the interstate system emerged as tangible facts on the landscape. Generally, those favoring traffic service predominated. The new Innerbelt, according to a report of 7 Oct. 1961 in the Cleveland PLAIN DEALER, “Loosens Downtown Traffic.” Occasionally, proponents of local development and property values managed to secure changes in routings and the elimination of extensions. In mid-1965, officials of the State Highway Dept. agreed to major changes in the location of interstate routes through the eastern suburbs. Observers noted that residents of these communities possessed wealth, which was imagined to translate directly into political protection, but unity and savvy were far more significant in the counsels of government. Traditional programs of road building and remodeling continued during the period of constructing the interstate system. The out-migration of households and businesses and a doubling of traffic during the first decade after World War II guided highway planners. From 1946 through the late 1950s, engineering staffs emphasized removal of bricks and streetcar tracks and repaving with concrete and asphalt. Beginning in 1946, officials spent $80,000 a mile to remodel Cedar Ave. between E. 2nd St. and E. 109th. The interstate system never refocused traffic toward downtown, nor did it encourage residents to remain in the city. By the late 1960s, officials had to extend main roads far to the south, west, and east in order to serve traffic and property in numerous subdivisions around the region. During the 1970s, attention in the region and nation shifted to repair and rehabilitation. Cleveland exhausted its funds, and other levels of government had to contend with inflation, declining resources, and fierce competition for road improvements. From the early 19th century through the late 1970s, engineers, politicians, and developers in the Cleveland region directed the funding and construction of a large and up-to-date highway system. Materials and design approximated national standards in each period. Equally, road builders in the Cleveland region served the conflicting interests of highway users and adjoining owners of property. During the period up to ca. 1900, property enjoyed the greatest attention; thereafter, the crush of traffic forced greater attention to the design and siting of roads with a view toward vehicular service. After 1900, moreover, the momentum of highway building encouraged the training of professionals in the fields of road construction and land-use planning. Professional status conferred political and social legitimacy, allowing planners and engineers to interpret traffic and urban changes for politicians and residents. Engineers in the Cleveland region and nationwide held a larger influence and exercised a greater authority, especially because they had access to the revenues created by state and federal taxes on the sale of gasoline. Nonetheless, rarely could engineers in the Cleveland region–or in the nation as a whole–fund and construct the mileage demanded. During this entire period, road builders served the conflicting needs of a commercial civilization.